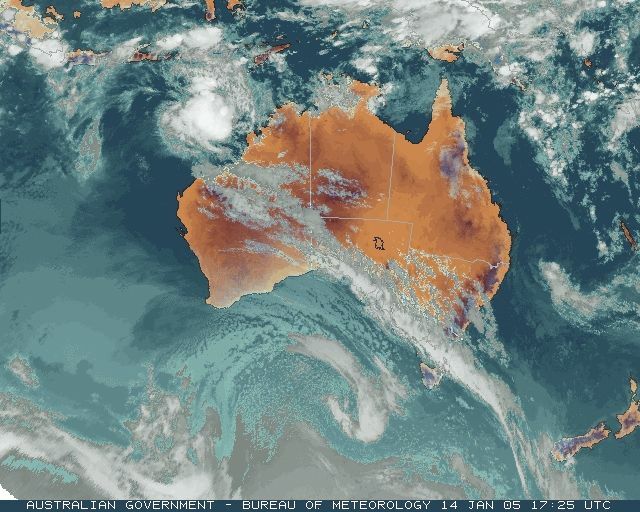 A near-stationary trough through NSW continued to draw in hot northerly winds, giving all but the coastal fringe and far south temperatures above the old century and from 8 to 12C above normal. Tibooburra Airport in the NW topscored with 44C, while Lithgow's top of 37 was 11.6 above normal. It has been the fourth day of well above average temperatures across much of the state, and the fifth consecutive day of 40+ maxima in the state's northwest. Thunderstorms developed mid-afternoon from the South Coast through the Central Tablelands to about Dubbo and moved slowly east before dissipating during the evening. In the Blue Mountains, thunder and lightning were almost continuous for over four hours, with violent electrical activity at times. A man was struck twice by lightning at Echo Point, Katoomba about 4pm. He suffered seizures and minor head injury, but was in a stable condition in hospital this evening. A second man was also struck but suffered only shock. Heavy hail on the western side of the Blue Mountains brought traffic to a standstill on the Great Western Highway. The heaviest hail was between Mt Boyce and Hartley. An eyewitness told the Lithgow Mercury that at around 6pm the hail had built up to such an extent near the bottom of Victoria Pass that it was impossible to drive on it. The Lithgow Bureau observer reported hail to 2cm diameter. A bushfire that started early this morning forced the evacuation of 100 residents of the mid-north coastal town of Geraldton. The fire burnt through 300ha and threatened property before being brought under control late today. It was an aggregation of three separate fires and is being treated as arson. A huge temperature contrast existed across SA today, as can be seen on the maximum temperature anomaly map at right. Two very different airmasses caused the extremes. 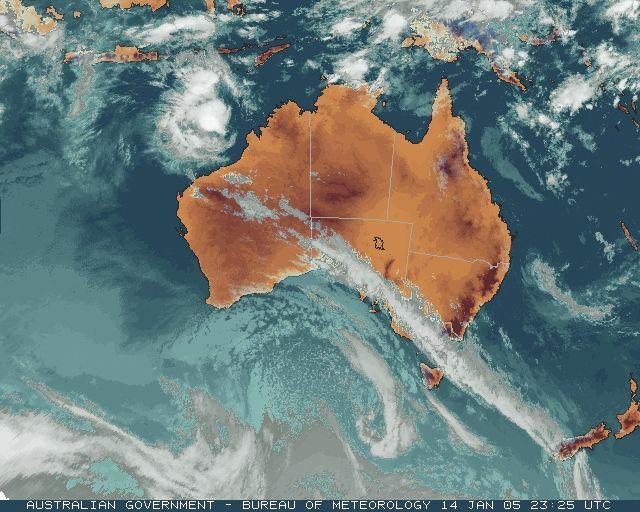 In the north, hot winds swinging around the trough over NSW were coming from the SE but retaining their heat. Cloudless skies also helped Marla and Moomba get to 44C and Marree reach 43. In the south, southeasterlies blew in off the Southern Ocean bringing temperatures a few degrees below average in the Southeast. 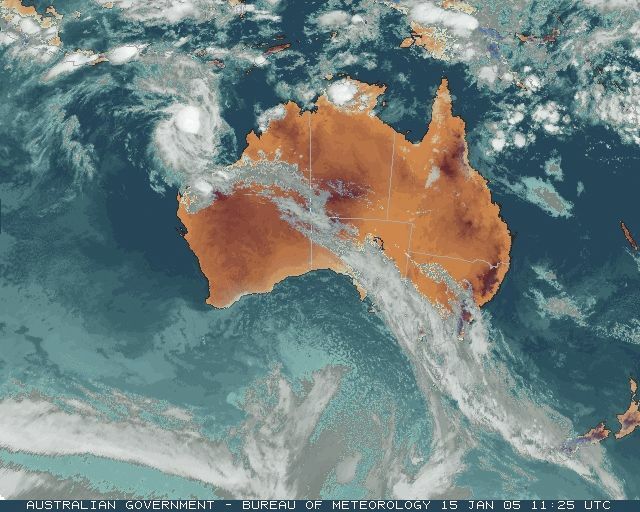 However, a band of heavy cloud along a line from about Ceduna to Mildura, visible in the satellite image above, moved along its own axis all day, keeping temperatures through central southern parts of the state extraordinarily low. Many locations failed to reach 20C (Ceduna, Clare and Eudunda only made it to 18), while Loxton's 17 and Nonning's 19 were more than 14 below average. 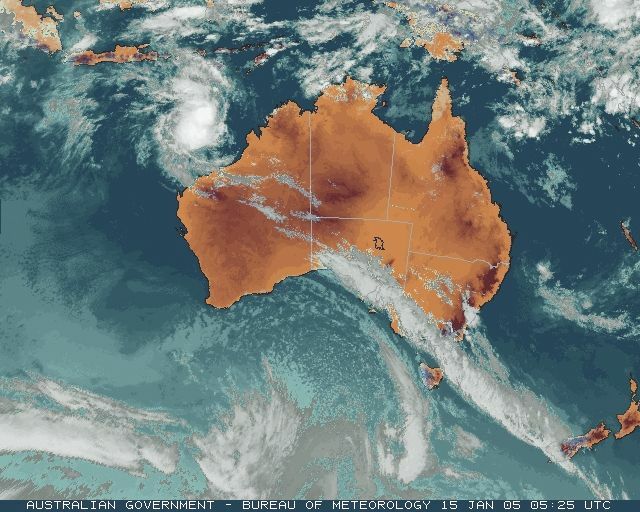 The remains of Tropical Cyclone Kerry, downgraded from cyclone status yesterday, sat about 150km east of Brisbane today throwing the largest surf of the season onto Gold and Sunshine Coast beaches. Fifty people had to be rescued during the day as 3 to 4m waves and dangerous rips kept lifesavers busy managing holiday crowds. These records are as received at 1154 EST on 05/02/2006. Help in interpreting these statistics and information on quality control is here.